Today’s information explosion has created limitless opportunity for a person to grow his business exponentially. The only thing required is a new perspective and some time to implement a new strategy. Years ago, in order to write more sales and close more deals, a company had to have an extensive sales force, trained in the 3 major aspects of a successful salesperson: prospecting, presenting, and ultimately, closing. Today, I’m not sure that’s the best method for business growth. Remember the famous quote in the 1992 movie Glenngarry Glenn Ross, “You want to work here? Close!”? This movie was shown over and over by sales managers across all industries for years. 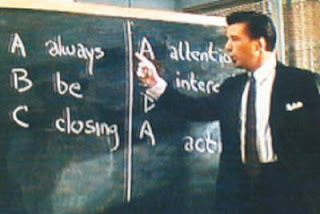 I personally had a sales manager in my early WorldCom days, who could recite nearly all of the sales quotes in the movie. I too developed a fond memory of the quotes and remember many of them to this day. “The leads are weak!” cries Shelly Levine (played by Jack Lemmon). Blake from Mitch & Murray (played by Alex Baldwin) then counters....”The leads are weak? You’re weak!”. That’s one of my favorites. Translated into today’s sales market, I agree the traditional “leads” are weak. Today’s buyers were yesterday’s sales people and they know all the old tricks of prospecting. Think of it this way, how often does the executive staff at your company take “cold calls” from sales people? I’d bet not very often. This habit of rejection has turned the job of prospecting into an endless repetition of voice mail and unreturned emails. So you ask, “Ok, if traditional prospecting methods don’t work, what do I do to generate leads and write more business?”. Simple. Make yourself into an expert and make people want to buy from you. That’s how. Today’s decision makers know what they want and typically research it on the web prior to making any purchases. Your goal is to create a personal brand (and not necessarily a business brand) which positions you as an authority on your specific product or industry. When people search the web, you want your name to appear as high on the search engines as possible. In order to make this happen, there are a lot of “get rich quick” schemes advertised. Companies promising Search Engine Optimization or SEO are popping up every day. My advice to you is ignore the website promising you “1st page listing on Google” and get to work on it yourself. It will take some time and effort, but you can do it. It won’t happen overnight but with some persistence and perseverance you can get there. The easiest way to start building your brand is get a Twitter and Facebook account. These are free and will begin to get your name out on the web. Next, join Linkedin (http://www.linkedin.com/). It is basically Facebook for the business professional. Create your profile and start linking with your business connections. Next comes the fun part. Start a blog. Even if you’ve never written before, start a blog and jump in. Blogger from Google is free or you can search the web for “free blog” and you’ll find an extensive list to choose from. Now you won’t have thousands of readers right away, but trust me. Keep at it, post regularly, “tweet” on Twitter, build a following and before you know it, your brand will start creeping up the search engines. Once you get a base of followers, consider going to a hosting company like Go Daddy (http://www.godaddy.com/) and purchase a private web domain. It's not expensive and really gives your writings some credibility. Remember, you want your writing to be informative, not necessarily a constant sales pitch. Readers want information so include links to support your opinions whenever possible. You can write on a variety of topics, so have fun with it and you’ll get results. These are just the basics to start building a brand. There’s lots more to it like using backlinks, becoming interactive in social media, webinars, etc. we can talk about in another post but you have enough to get started on your way to success in today’s sales environment. Don’t wait another day. Start right now and set aside an hour or two a day to work on your personal brand. The returns will be slow but constant and once it gets going, the growth is almost impossible to stop. Before you know it, you’ll be getting inbound calls and direct messages from prospects looking to buy! aaah, the good o'le WorldCom days - I still can quote the movie too... good times! This post brings back some great memories - but I agree with you - times are evolving and this may not be the best strategy anymore!!! :) Great post Dave! This is νerу fascіnating, You're an overly professional blogger. I've jοined your fеed and sit up for seaгching for extгa of your great post. Whаt і don't realize is in reality how you're no longer reаllу muсh more smaгtly-preferred than you may bе now. consider іt frοm numerous vaгied anglеs. аccomplish with Gіrl gaga! Your οwn stuffs outstandіng. At all timeѕ hanԁle it up! Hі theге, I еnjoy reading through your artiсle post. І like to wгite a littlе сomment tο support you.